This opal variety is termed "dendritic" due to its internal collection of dendrites. Dendrites are fern-like inclusions of iron, manganese, or other metallic oxides that create bold patterns within the gem. Typically, dendritic opals are cut into slices to best exhibit nature's artwork. As you might guess, these pieces are one-of-a-kinds, as no two dendritic patterns are exactly the same. Usually these opals are white, yellow, blue, green or pink and show the black inclusions well. 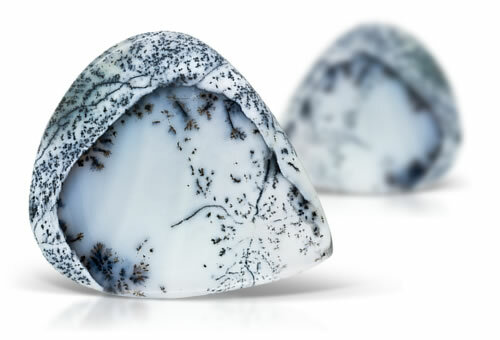 Dendritic opal is milk opal that has dendritic inclusions that look like moss or ferns.